Working to replace unpleasant odours and protect against environmental threats, the Purify Cleansing Blend produces an airy aroma that purifies the air in a natural, safe way. I love using this oil in my homemade shoe deodorising spray and also to clear the fridge of any yucky odours. doTERRA Purify is an uplifting blend that combines citrus and pine essential oils to leave an airy, fresh scent on surfaces and in the air. 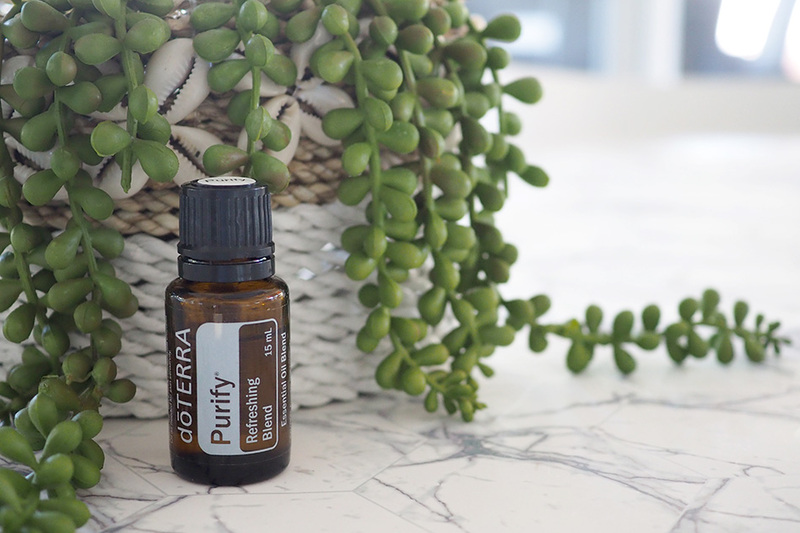 A favourite among doTERRA users, Purify can replace foul smells quickly and can be used as an effective cleaner throughout the home. 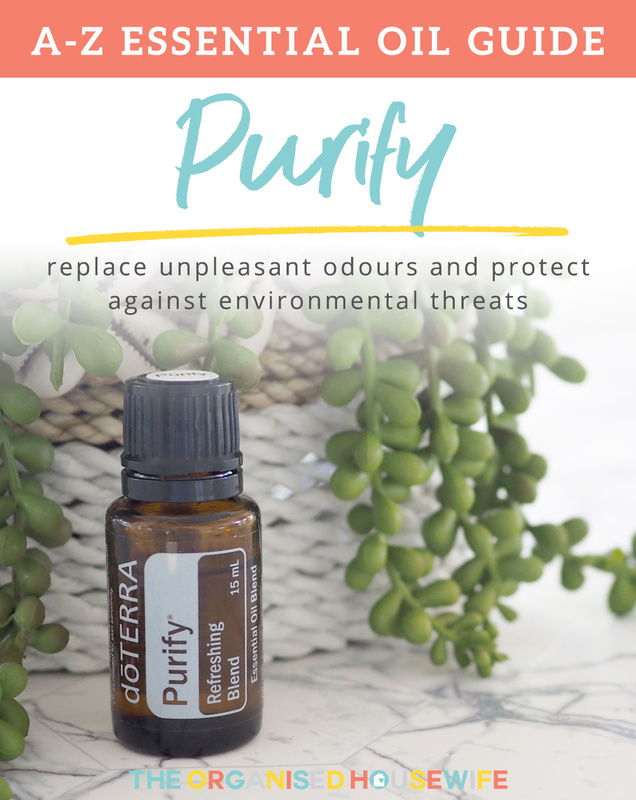 Odour Elimination – Experience the power of Purify essential oil blend by diffusing it in rooms that contain harsh odours or stagnant smells. Purify’s refreshing and herbal aroma will quickly fill a room and replace unpleasant odours with a clean scent as it purifies the air. If you’re looking for an easy and natural way to eliminate odours in bathrooms, locker rooms, or gym bags, Purify is the perfect solution for you. Combat Seasonal Threats – When environmental threats run high, use Purify essential oil blend to combat adverse effects. Purify can be used to protect against environmental threats and can help minimize the effects caused by agitating environments. Fix Pungent Car Odour – If getting into your car causes your face to crinkle because of the smell, it’s time for Purify. For a quick fix to a pungent car odour, place a few drops of Purify cleansing blend on a cotton ball and put it in or near your air vent. The fresh and purifying aroma of this blend will swiftly encircle your car with a light and airy smell your nose will be sure to love. DIY Cleansing Spray – Forget the toxic chemicals of traditional cleansers and create your own cleansing spray with Purify. For a natural and effective household cleaner, simply add five drops of Purify essential oil blend into a small spray bottle filled with water. This minimalistic combination is perfect for wiping down countertops while leaving a fresh scent in its wake. Laundry Scents – It’s a fact that some odours linger a little bit longer than others—especially when clothes are concerned. Sometimes putting your smelly clothes into the laundry doesn’t always translate into stench-free clothing coming out. For clothes that come out smelling as clean as they look, add a few drops of Purify essential oil into the rinse cycle when doing laundry. Purify will help eliminate tough odours. DIY Stove Top Cleaner – Is your stove top caked with difficult liquid stains and charred food? Turn that kitchen eyesore into a shiny appliance with this DIY Stove Top Cleaner recipe including Purify essential oil. This easy recipe will help clean off grime and leave the stove’s surface looking clean and sparkly. Sneaky Air Vent Purifier – To give a fresh, herbal aroma to small rooms, place a few drops of Purify essential oil blend onto a cotton ball and put it into the air vent in the room. When the air blows through the vent, it will waft in the refreshing scents of Purify—giving the room a continual burst of clean and fresh air. Sooth Bug Bites – If after a long day of outdoor adventure you notice multiple bug bites, don’t panic. Purify has strong cleansing properties that can help soothe skin irritations, like those from bug bites. Simply add one to two drops of Purify essential oil to the bug bite or skin irritation and you will soon feel its soothing properties kick in. Welcoming Home – Before hosting a friendly get together at your home, place three to four drops of Purify essential oil blend into the diffuser of your choice. Diffusing Purify will have the air smelling fresh and clean, perfect for welcoming in your guests. DIY Fridge Refresher – With a fridge full of dynamic foods with distinct aromas, it’s natural for the fridge to start smelling, but that doesn’t mean you have to live with a smelly fridge. With DIY Fridge Refreshers, you can keep your various smelling foods together without the pungent odours. Fridge refreshers are easy to make and only have four ingredients—including Purify essential oil. Purify will help keep those powerful odours at bay so that you can enjoy a fresh smell whenever you open the fridge. HOW DO YOU USE PURIFY ESSENTIAL OIL?